A rich, intense and full-bodied single malt with all the sherry-derived flavours the dark colour already promises. Aromas of ripe dark dried fruits, together with winter spices and notes of tobacco and leather, create a harmonious and full-bodied taste experience. 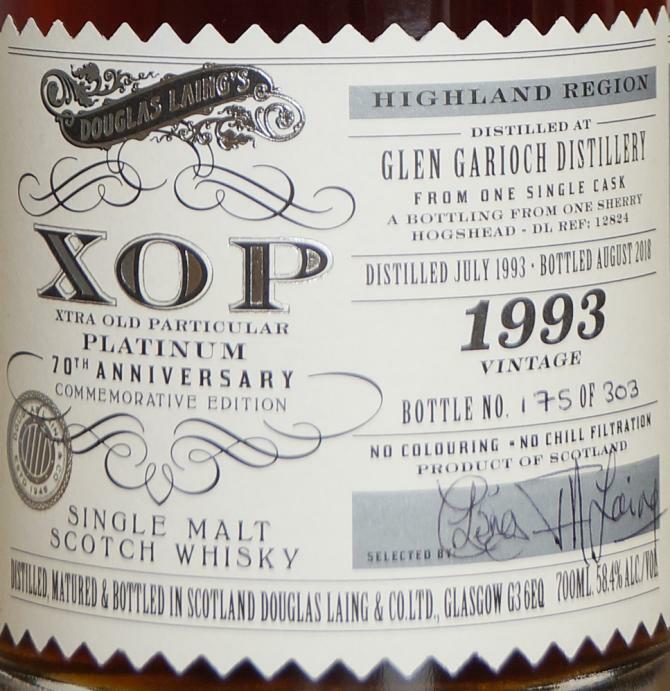 An excellent single cask bottling on the occasion of the 70th anniversary of Douglas Laing. As the high alcohol content is perfectly integrated, this 25-year-old Glen Garioch can be enjoyed without any water - ideally sitting in a leather armchair in front of a crackling open fire. The nose starts off with old sherry, raisins, brown sugar and juicy blood oranges, before caramelised ginger, cinnamon and nutmeg arrive. Notes of dark chocolate nicely linger with leather and spiced oak in the back. Rich and very appealing! Full-bodied, rich and intense on the palate with sherry, sweet ripe plums, raisins, luscious oranges and Demerara sugar. Then warming spicy flavours of nutmeg, ginger, oak and white pepper arrive, followed by slightly dry notes of dark chocolate and cocoa. Nicely mouth-coating! The finish is long and pleasantly warm, becoming drier on the tail with espresso notes, bitter orange peel, walnuts and oak spice. 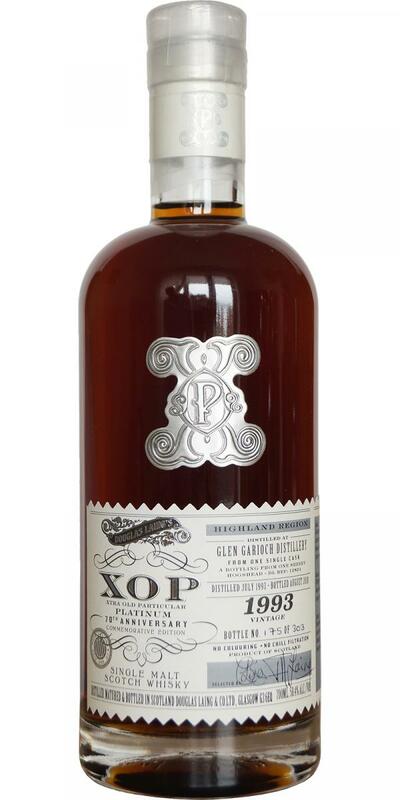 Nose: a sherried beauty... chewed leather, burnt brown sugar, raspberries and juicy plums. Palate: thick and mouth-coating... rich mocha, stewed rhubarb, pastry and cinnamon spice. Finish: charred oak lingers alongside stem ginger cookies, cocoa and cereal sweetness (CSL). Very herbal, brown sugar. In the background sherry. With time the sherry note becomes more dominant. Rosemary, Thyme, wood and butter.